Clicking on this image will show it larger on a new page. This can't be right! If my flight cost $200 and I stayed for 10 days it would be free. Right? You can kick off this activity by asking students to think about where in the world they would love to travel to. Kids can then look up flights to that destination from their area airport. Don't have students use the promo code, just have them work out the discount by hand assuming it is $20 off per day of travel. You might have students organize their work (or you can help them see a more organized version of their thinking) where through repeated reasoning (MP7) they notice the cost of the flight - 20 x number of days = final cost. Are there different rules to represent this situation? What do our variables represent in the context of this situation? Students will hopefully notice that this deal seems too good to be true and it is. 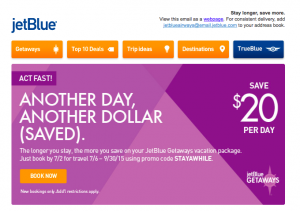 The deal actually applies to booking a hotel reservation through Jet Blue. Students get back to work analyzing the actual deal, conducting some repeated reasoning with real numbers, generalizing a rule and then showing algebraically that this rule could never be true. This is great context to work on one variable, multi-step equation solving in 7th grade or high school (under the Common Core Standards). For members we have an editable Word docx, suggestions, and solutions.